India has a coastline of more than 7000 km and an Exclusive Economic Zone (EEZ) over 2 million km2. A total of 770 species of seaweeds have been reported from different parts of the Indian coasts which includes 184 species of green, 166 species of brown and 420 species of red (Sahoo et al., 2001). Unlike the oriental countries like Japan, China, Korea, etc. India does not have a long history about the uses of seaweeds as food and various other purposes. However, in recent years a lot of interests have been generated by the industries, academia and researchers in the field of seaweeds research and utilization. One of the most difficult job in this area is the identification of various species. 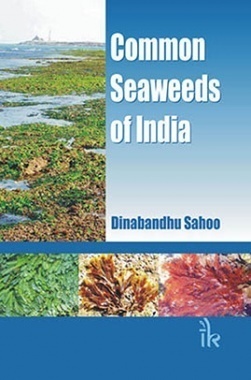 This book deals with identification of some of the common seaweeds of Indian coast. Only the most suitable specimens are described and illustrated with colour photographs. Most of the photographs were taken in the natural habitat, but in some cases herbarium specimens have been used. The work is the compilation of the author’s field studies of more than two decades. Common Seaweeds of India will be useful to teachers, researchers, students, industries and many others in identifying the common seaweeds. 1. This volume includes 113 algal species including 31 species of green, 30 species of brown, and 52 species of red seaweeds. 2. Has a dedicated chapter containing pictures of the various hotspots of the Indian coastline. 3. Contains colour photographs of all the important seaweeds either in their natural habitat or as herbaria.